Food Adventures of a Comfort Cook: To Dump or Not To Dump. To Dump or Not To Dump. Infomercials, they seem to be taking over, not just entire cable channels, but advertising altogether. 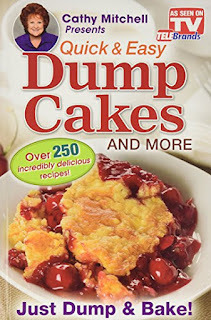 One I admit falling for was Cathy Mitchell’s Dump Dinners Cookbook which came with an awesome 9 x 13 baking pan plus Dump Cakes Baking Book. What a bargain for $19.95 plus shipping and handling! While I have not dumped any dinners as yet, I have tried a couple of cake recipes which led me to a question. 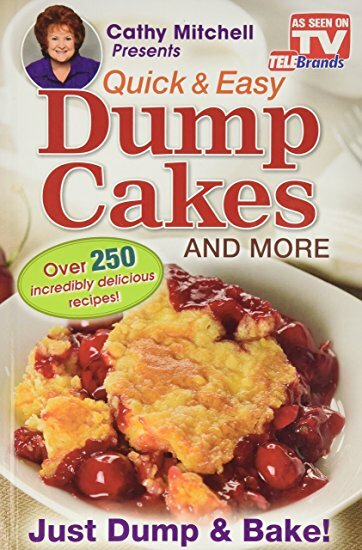 Why the term “dump cake”? Actually this term covers baking methods as far back as the 1600s, colonization of the United States and creativity due to a lack of ingredients. Names like Cobbler, Grunt, Pandowdy, Sunken and Brown Betty became synonymous with locations throughout the eastern states. Two basic methods developed, the first being “one bowl”; all ingredients mixed into a batter within one bowl, poured into a baking pan, baked and served. The second was layering and topping with uncooked biscuit dough (origin of WW1’s dough boys), rolled oats, bread crumbs, crushed crackers or graham crackers. American cooks (1800s to present time) tend to use fruit as a major component, whereas the British colonists brought over their recipes of savory recipes using beef, lamb and mutton. Personally, while discussing this next baking project with friends, it seemed that almost everyone had recipe dating back to mom, or grandma. To judge both methods, I prepared two “cakes”, the first being one bowl using spiced apples (thank you to the late Marie Watkins) , the second with cherry pie filling from a can. 1 – Preheat oven to 350F. Spray 9 x 13 inch baking pan (or 2-9 inch round pans) with nonstick cooking (baking) spray. 2 – Place apple pie filling in large bowl; cut apple slices into chunks with paring knife or scissors. Add cake mix, eggs and oil; beat 1 to 2 minutes or until well blended. Spread batter in prepared pan; sprinkle with pecans. 3 – Bake 40-45 minutes or until toothpick inserted into center comes out clean (mine took 60 minutes altogether). Cool in pan at least 15 minutes before serving. This recipe produced cakes; real cakes that rose and became yummy snacking cakes which my taste testers enjoyed. Truthfully, I didn’t see much difference with this recipe than following the instructions on the box and adding pie filling. The layered method produced results which were, well, iffy to the taste testers, since some did not even give comments, positive or negative. Sometimes it is best to remain neutral. Anyway, with cake #1, I used peach pie filling; it was definitely a cobbler with the cake mix plus melted butter creating a crumbly topping. Cake #2 was tart pie cherries and chocolate cake mix; this turned out to be a gooey mess with not all the cake mix and melted butter mixing together. It was best to be served as an accompaniment with ice cream, or layered in a bowl with whipped cream, but not as is. For the recipes, I sort of mixed and match from ones I read, and ones that were offered to me. Preheat oven to 350F; spray 9 x 13 inch baking pan with nonstick baking spray. Spread pie filling over bottom of pan; mix together cinnamon and sugar, sprinkle over pie filling. Spread cake mix over pie filling, pour butter over cake mix as evenly as possible. Bake 45-50 minutes (again, mine took 60), or until pie filling is bubbling up along sides of pan. Let cool 15 minutes before serving. Spread cherries plus ½ cup water (or pie filling) over bottom of pan; sprinkle sugar over top. Spread cake mix over fruit, pour butter over cake mix as evenly as possible. Spread walnuts over top. Bake 45-50 minutes (again, mine took 60), or until liquid is bubbling up along sides of pan. Let cool 15 minutes before serving. When it comes to these recipes, I say try them as is, or play with them to see what you can create yourself. One thing for sure, you’ll definitely decide if you rather dump bake, or dump the cake.